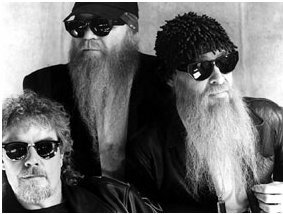 The bearded trio, all three of the same age, wacky, still appear (2007) in concert although these past few years their music hasn’t had the success of the 70’s and 80’s. These guys make you move with the first chords. Inseparably identified with Texas, Harley Davidson, and Rock Music they have obviously inspired the author of this zigzag pipe. Don't believe that this stem is manufactured with the usual materials. It cannot be that of a molded plastic because drilling the airway as is done normally is not possible in a single go with such geometry. I guess there are some who sport a mocking smile in reading of the next line: it will fail the test of the pipe cleaner that is for sure! Another, more perplexing problem, arises from the issue of cleaning this pipe. Normal methods are simply ineffective. What to do? Take your ZZ Top pipe to your mechanic. If you know a car body repairman all the better as he is more likely to have an air compressor that delivers high pressure. He uses it to clean or dry fixed bodywork. Unscrew the bowl of your pipe and put the compressed air outlet into the shank. Do not direct the free opening of the pipe toward you but away from you. Make sure that nobody is in front of you. Pull the trigger! Pfouiiitch! Tar, nicotine, unhealthy residues, unsmoked tobacco are gone. Screw he bowl back on and thank your friendly mechanic. 7,00 € (observed in 2006). 34,00 € (observed in 2009).